SAN SALVADOR, Jan 16 2012 (IPS) - Two decades after the signing of the Peace Accords, together with the social commitments they contained, El Salvador’s levels of poverty and violence are so high that academic and social leaders are proposing new accords to overcome the crisis. This initiative, according to analysts, should emulate the negotiating spirit and willingness to give and take that were the hallmarks of the peace process, engaged in by leftwing insurgents of the Farabundo Martí National Liberation Front (FMLN) and the government of then president Alfredo Cristiani (1989-1994) in order to bring to an end 12 years of civil war that left some 75,000 people dead and 12,000 disappeared. 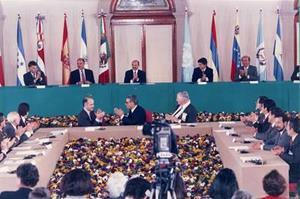 In spite of their diametrically opposed ideologies, the FMLN – now a political party and governing the country with President Mauricio Funes – and the ultra rightwing Nationalist Republican Alliance (ARENA) reached a consensus facilitated by the United Nations, and in Mexico on Jan. 16, 1992 they signed the agreement to end the war and attempt to salvage the ruined economy. The Peace Accords laid the groundwork for a democratic transition in a country that had previously endured military rule, either directly or as the power behind the scenes, in the interests of the wealthy and powerful elite. Broad swathes of the population were persecuted and killed simply for wanting to change this unjust situation. “If we were able to overcome the brutality of war through dialogue, we can also defeat poverty, inequality and violence through dialogue and concerted decision making,” wrote analyst José María Tojeira in an editorial in La Prensa Gráfica, a local newspaper. The 20th anniversary of the signing of the Peace Accords coincides with an acute economic crisis and an apparently unstoppable wave of murders of civilians. El Salvador is ranked among the most violent countries in the world, with 70 homicides per 100,000 people, according to official statistics from the Institute of Legal Medicine. Of El Salvador’s six million people, 36.5 percent live below the poverty line, with 11.2 percent living in extreme poverty, according to 2011 figures from the economy ministry. “What we need is to further develop the democracy that we initiated 20 years ago… the challenges are enormous, but so are the opportunities,” Nidia Díaz, a lawmaker in the Central American Parliament and a member of the FMLN team that signed the historic pact in Chapultepec Castle, Mexico City, told IPS. Retired general Ernesto Vargas, who signed the accords on behalf of the government commission, said that new negotiations involving all relevant actors are not only viable but necessary, given the huge challenge of overcoming the country’s acute problems. “There must be a countrywide agreement with an institutional focus… free from ideologies, motivated only by the desire for a better nation,” just as occurred two decades ago, Vargas told IPS. As a result of the 1992 Chapultepec Accords, the Human Rights Ombudsperson’s Office was created, as well as the National Civilian Police (PNC) and the National Public Security Academy to train police, including demobilised guerrillas and soldiers, with a civilian vision. Some of the insurgents were given land to farm. Mechanisms were also adopted to make the justice system, which for years had suffered from corruption and political manipulation, more effective and transparent. However, two decades after the accords the justice system continues to be afflicted by the same evils, according to local analysts and international reports like that of the U.S. Department of State, which makes an annual survey of problems related to this issue in El Salvador. “As long as the (composition of the) Supreme Court remains in the hands of the Asamblea Legislativa (Congress) and is subject to the agreements between party leaderships, it will serve those interests,” Ramón Villalta, the head of Social Initiative for Democracy, a civic education NGO, told IPS. After arduous negotiations, and very grudgingly, the military commanders accepted a reduction in the number of their troops, and the cashiering of individuals and units responsible for human rights crimes, including massacres such as the one in El Mozote, perpetrated in December 1981 by the Atlacatl Battalion, in which about 1,000 people killed. On Monday, President Funes formally sought forgiveness from the people of El Salvador for the El Mozote massacre, acknowledging the army’s culpability, in the context of official activities to mark the 20 years of peace. In exchange for the downsizing of the armed forces, the FMLN agreed to lay down its arms and participate in the country’s political life as a legal party, which led to the electoral victory in March 2009 that put President Funes, a moderate, in office. International pressure was a key factor for ending the civil war, and especially for persuading the military to make concessions. The international outcry increased after the 1989 murders of six Jesuit priests, their cook and her daughter, by an elite armed forces unit, during a fierce guerrilla offensive that paralysed the country for three weeks. Analysts are now saying that in spite of the lessons learned from the peace accords two decades ago, reaching consensus is still a complex process in a country like El Salvador, where people still hold rigidly to opposing ideological positions. “Negotiating new accords is not viable at the moment; the necessary correlation of forces is absent,” analyst Dagoberto Gutiérrez, a former guerrilla commander who also participated in the negotiations 20 years ago, told IPS. “Economic and political power will only negotiate when it is necessary and inevitable, and right now that is not the case,” he said. The Peace Accords put an end to the war, which was the most urgent need, but they did not succeed in bringing about deep-rooted economic changes which could have ushered in a new paradigm for the country. “To really change the economic issues, we need another 20 years of war,” said Gutiérrez. Political scientist Salvador Samayoa, another signatory of the 1992 agreement, castigated those who criticise the accords for “only” concluding the war and not solving crushing economic and social issues, a fairly widespread criticism since 1992. “As if (stopping the war) were a very easy thing to achieve, or somehow not very important… Ask a mother, if she could go back in time and prevent the death of her son, if that would have been less important,” Samayoa wrote in the newspaper El Diario de Hoy.